A special commission as part of the 100 Years of Stainless Steel celebrations, The Big Melt is a feature length elegy to the men and women who toiled in Sheffield’s steelworks and a hymn to Britain’s proud industrial past. Working with Sheffield’s own musical hero Jarvis Cocker, acclaimed director Martin Wallace has woven an exquisite tapestry of steel industry-related archival footage drawn from the BFI National Archive. 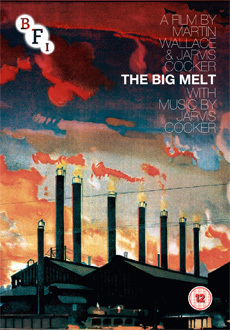 Jarvis also provides the film’s stirring musical accompaniment, collaborating with a raft of Sheffield’s finest musicians, including a string quartet, a brass band, members of PULP, Richard Hawley, The Forgemasters and a youth choir. Performed live at Sheffield’s celebrated Crucible Theatre at Doc/Fest 2013. The DVD includes the full archive-based film, plus a recording of the live event. Recording of the live performance from Sheffield International Doc Fest 2013. Interviews with Martin Wallace and Jarvis Cocker.